Gov. 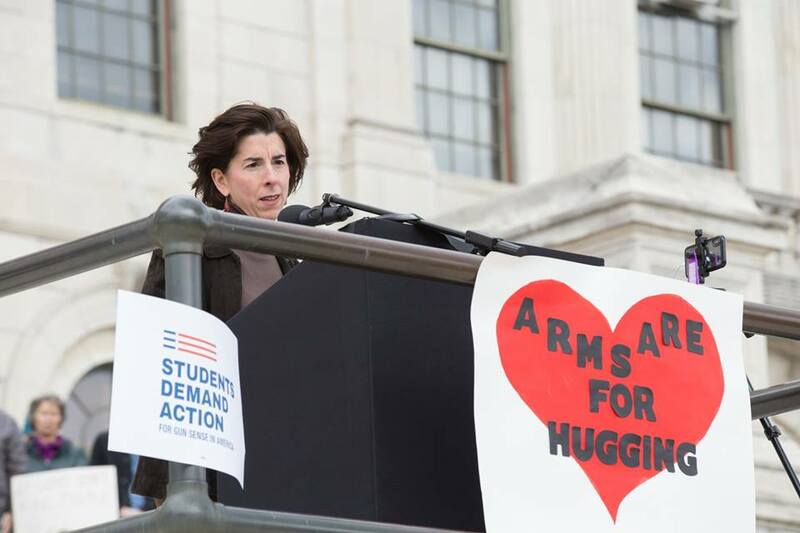 Gina Raimondo has renewed her efforts to increase gun control in Rhode Island. At a news conference at the State House, scheduled on the one-year anniversary of the Parkland, Florida attack, Raimondo announced her plans. Raimondo has proposed three gun control bills. The bills would ban guns on school grounds, ban “assault weapons” and ban “high-capacity” magazines. The school grounds ban would prohibit carrying any weapon on school grounds, within 300 feet of a school building or on school-provided transportation. The penalty for violating the law would be at least one year, and up to five years in prison and a $5,000 fine for an adult. A juvenile offender would also lose his driving privileges for up to six months. The bill makes exceptions for law enforcement officers or other contracted security officers at the school, and for unloaded guns in a locked container in a car. “You don’t want guns in proximity to kids in schools, period,” Raimondo said. The ban on “high-capacity” magazines will seek to prohibit any device that can hold more than 10 rounds of ammunition. Those who own prohibited magazines would be required to surrender, modify or sell them within 180 days of the bill becoming law. “If making magazines smaller so that someone has to reload before they can fire again, and we buy one second, two seconds or three seconds, and a first responder can take that criminal out or the person can get away, that’s worth it to me,” Rhode Island Attorney General Peter Neronha said. The bills are based in part on recommendations from the Rhode Island Working Group for Gun Safety. The Group was convened by Gov. Raimondo and issued its Final Report and Recommendations on October 4, 2018. Frank Saccoccio, the president of the Rhode Island Second Amendment Coalition opposes all three bills. “Our children go to school every day with no protection, and Gina Raimondo’s plan does nothing to enhance it, in fact our opinion is that it makes it worse,” Saccoccio told local news affiliate WPRI. Bills similar to the three proposed by Raimondo have been introduced in past legislative sessions and died in committee. The Parkland shooter used ten round mags. The seconds it took to reload did not matter to the first responders as they cowered outside. Limiting mag size and types of weapons is designed to restrict gun owners from being on a level playing field with the government. So many times these laws mention bayonet lugs. Don’t ever recall a mass shooting with a bayonet charge. This dumbass will have to outlaw everything that can be used to “assault “another person! Also no such thing as a “high capacity magazine “.whatever the firearms magazine is supposed to hold from the manufacturer, is the OEM capacity. Saw a 249 SAW Semi- auto with 250 round belt OEM their also. All I got to say to him is “see u wouldn’t want to be ya”. Just say’n! These, so called, “bills” are poppin up more & more and the NRA, it’s attorneys, and ANY Pro 2nd amendment supporters, need to start putting MORE action where their mouths have been all the years that there has been, somewhat, “calm” regarding our 2nd amendment freedoms! The upcoming years are NOT going to be more relaxed, only more bills attempting to not only take ALL our weapons (personal security) but, eventually, our every freedom. An American that cannot see the socialist agenda, creeping under a once secure constitution, needs to watch the small amounts of truth that the liberal media gives! Those 2nd amendment opponents has a MUCH larger plan than “just” to disarm every American! Please, don’t doubt it!! One thing is certain, those that love the right to protect your loved ones, your property, your own safety, need to get involved NOW! People can not wait until one minute before “the clock strikes midnight” to do something because that will be much too late! I don’t want Americans to lose their 2nd Amendment rights AND I don’t want to give ANYONE the ability to “chip away” at the 2nd amendment either, DO YOU? Americans will NOT be warned when the day of full confiscation arrives (IF, God forbid, that should occur)! Don’t YOU think that NOW is the time to forewarn them, (via OUR legal actions), before we are, AGAIN, forewarned of their NEXT strategy to eliminate MORE of our gun rights, via “bills” (ETC.)??? Thank you for reading the preceding, which concerns EVERY American. I sincerely pray that you will think about everything you have read, investigating this matter further, and doing what you can do to assist in ending the attack on OUR Constitution. IF you want to do something but can’t because of……….. Feel free to show your support by ANY contribution. This WILL aide the legal defense of our 2nd amendment. Thank you, again, and we are hoping to hear from you. This is a bureaucratic train wreck in the making, for most of these laws, like confiscation of magazines, are unenforceable. These are also a good way to destroy a political career by becoming a fascist politician by creating a new type of criminal from law abiding citizens. Why not confiscate guns from criminal on a preemptive basis? Again because it is unenforceable so bit up the law abiding citizen and leave them unprotected. Remember that the police is a mostly a reactionary force and they do not have a mandate to protect individual citizens but the public at large. If “the pen is mightier then the sword” why don’t all these self anointed politicians go after and ban or modify the First Amendment. After all, mass shootings were a relative unknown thing until the press glorified Columbine and sensationalized the many copycats shootings afterward. It stands to reason if the first was never heard of none would have followed. Case in point was the 4 kids in NJ who gassed themselves with a running car in a garage, Press from NJ to California played it front page. For the next 6 months copy cat kids offed themselves the same way. Think there was a connection? the First Amendment in the hands of a corrupt press has killed more people than guns. Organized Crime is controlling the Politicians because “They Don’t Want to Face a Armed Citizen, so who’s pushing Gun Control?? Hitler banned guns and look what happened. Any location that bans Guns is a target for any mentally compromised individual. These individuals will always choose a target that can’t shoot back because bad people always want to control and harm those who are weaker or unable to fight back. Government extremists want to use bandaid measures instead of fixing the root of the problem which is mental health. Bad people will always seek a way to do their dirty deeds by whatever means they can. We have seen that these killers can obtain Guns illegally or use cars, knives, and bombs. Hitler did not ban guns for the German population. However, Reagan, Clinton, Bush, Trump and the US Congress have banned certain guns, accessories and ammunition. Some lever action rifles back in the 1890s held fifteen rounds. The technology that has been around over 125 years is now “too deadly” for the common American citizen. And if you think they will stop with ten round magazines you are mistaken. They want all the private guns gone. Let me go out on a limb and guess that she’s a democrat. Do I get a cookie? When in the hell will these assholes figure out that criminals do not follow gun laws. They are only hurting law abiding citizens who do follow the law. These gun grabber laws are futile in stopping the problem. Their proposed bans that they ignorantly believe will reduce/stop mass shootings will do nothing to prevent a sick human from gathering the tools to do the deed. Common sense says if I want to stop the rain from blowing in my window, I close the window! I can’t stand outside and try to deflect the rain drops from blowing through. That is my analogy to stopping a school mass shooting. Put the stops in place at the school. Don’t believe keeping the bad guy from getting the tool will keep it from happening. The democrats, socialist whatever they are calling themselves this week. They have openly shown all the world that they are after our guns and the second amendment! “We The People” are going to be forced to take action if we can not rein in these loose cannons and American haters that want to turn us into a bunch of slaves for them to use to profit themselves! Until we recognize who the real enemy is we can not fight them, it’s not each other as the lying media wants you to believe , it’s them! Why are democrats so dumb? Can we just ban them instead? First, Mark N is correct on all his points. Second, people that know nothing, or next to nothing, believe the solution is to make it more difficult for the shooter. This is wrong on a couple of levels. These people, the shooters, are not of sound mind. Does anyone really believe that they are going to abide by some law preventing hi-cap mags, perceived assault weapons? Also, these things do not matter to them. They are going to get/find what they want one way or another. As Mark N stated, magazine capacity is a moot point if the victims have to safety to run to. What is not mentioned by any lawmaker is the number of times that a person carrying legally has stop a shooting or provided “back up” to police officers and civilians who would have been killed had that person not been carrying legally. Stop punishing the legal and lawful firearms owners. Start fixing this by better background checks, actually making someone who possesses a firearm illegally pay the penalty by jailing, fining them. Go after the people that are selling these firearms. I have had enough of lawmakers screwing with my rights to own firearms and restrictions galore. I want them to start working the other side of the street and quit hiding behind the premise that the shooter has rights too. Last I knew, it is illegal/against the law, to buy a firearm, through a straw purchase or illegally, and then go kill people. Legal, sane firearms owners are not out doing these types of things, so stop making our lives more difficult only because it looks like the easy fix. This latest effort to deny citizen’s the right to self-defense by Rhode Island’s communist tyrant, is indicative of a coordinated, nation-wide attack by the communists of the Democrat Party. EVERY nation that disarmed it’s citizens then proceeded to exterminate those they disarmed. Notice, the badged thugs, the enforcers of the new American Communist Party, will be exempt from these latest efforts at tyranny by Rhode Island’s female Marxist. Come and take them governor. Just send an invite to all the would be media magnets, Come Kill Our Lambs. So, when are we Patriots going to use our guns like the 2nd Amendment says and erase this political pos???? I ask myself that same question often. The Parkland shooter used 10 round mags. That should, but refuses, to put an end to the myth about “hi-capacity” magazines. The Sandy Hook shooter used large capacity mags–but usually swapped mags before he emptied them. Strike two. And on top of all that, neither had armed resistance, so that one or two seconds really didn’t allow anyone to get to safety or shoot back. Strike three. The magazine capacity argument is just a talking point for the communist tyrants of local, state and fedgov. It is no different than their “pistol grip feature” the communists have used to define their use of the term “assault weapons”. Recall when the Marxists used the term “global warming” to advance their control over populations, their wealth and move to one world government ? When that was debunked they changed their propaganda of “global warming” to “climate change”. These politicians are practicing sedition against the people of this nation and the United States Constitution. They are all deserving of being charged with sedition and treason, given their fair trial and upon conviction, marched to the gallows. Words have meaning. And words are used to advance deception upon the masses.